Burger Up is quick to learn yet offer players a satisfying puzzle challenge of matching ingredients to complete orders ahead of your rivals. While speed is important, the bigger you make your burger, the more rewards you earn. 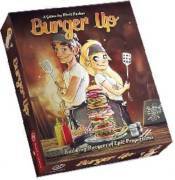 Burger Up offers players a fun and delicious experience in a densely packed game.